To celebrate the launch of Paddington Bear coming to the big screen in November, 50 statues of the fictional bear are on the streets of London. 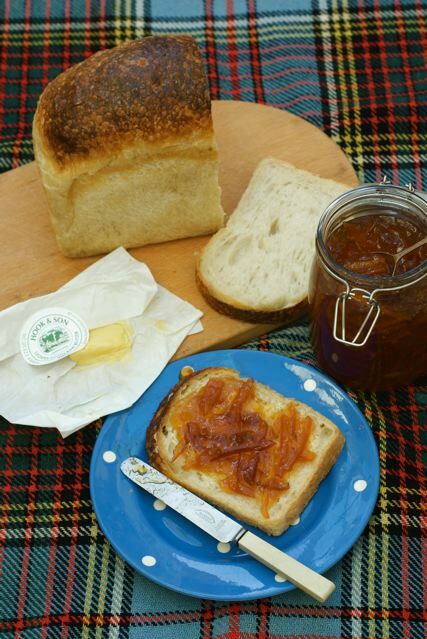 Today I have a guest post from Borough Market’s with an ultimate marmalade sandwich recipe.. Celebrating Paddington’s first glimpse of Borough Market. 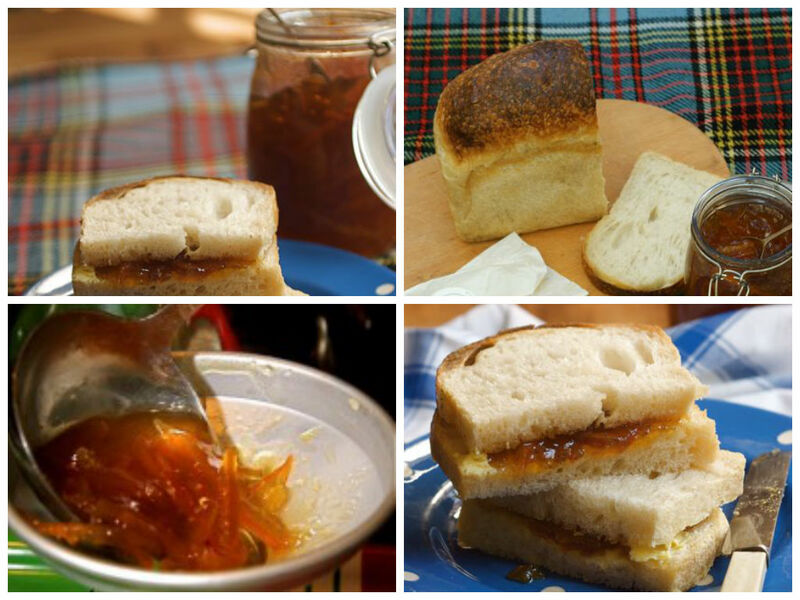 Paddington couldn’t fail to love this marmalade sandwich: Plain and simple, no fancy twists, but made with the finest ingredients a bear could wish for. Wash the oranges and lemon well and then put them in your pan and cover with water. I weighed down the fruit with a small dish to stop it bobbing above the surface. Cover with a lid and then boil for 1-2 hours until the peel feels soft and can be easily pierced with a fork. Meanwhile enjoy the ambrosial citrus scent wafting around your kitchen. Remove the fruit from the water and allow to cool. Measure the liquid left in your pan, you will need about 1.25 litres. If you have too much you can reduce it by boiling, too little – just add a splash of water. Now for the fun, and many hands do make light work; it’s time to prepare the fruit. Quarter the oranges and lemon. Take a spoon and scrape the pith, flesh and seeds into a large sieve set over a bowl. Slice the peel into coarse or fine shreds, the choice is yours (it wasn’t mine as an impatient seven year old will always mean thick slices). Put the peel into the pan with the measured cooking water. Take a rubber spatula and squash as much juice as you can from the pulp in the sieve and tip this into the marmalade pan. Put the remaining pips and pulp into a muslin square and tie up (or take the pop sock approach) and then dangle this down into your pan too. 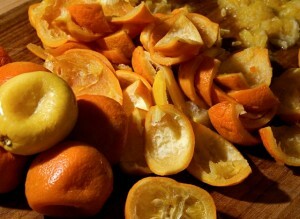 The pith and pips contain masses of pectin which will set the marmalade later. Bring the pan up to the boil and then remove your bag, or sock, and give it a squeeze to release as much of the valuable pectin as possible back into the marmalade. Tip in the sugar and place the pot on a low flame. 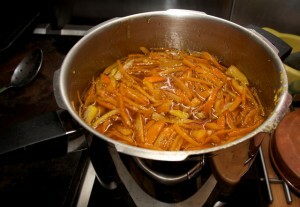 Once the sugar has dissolved you can up the heat and bring the marmalade to a rolling boil. Watch it carefully, you don’t want it bubble over. Give it a stir and skim the froth from the surface from time to time (or you will have cloudy marmalade). Now you’re on the home straight. 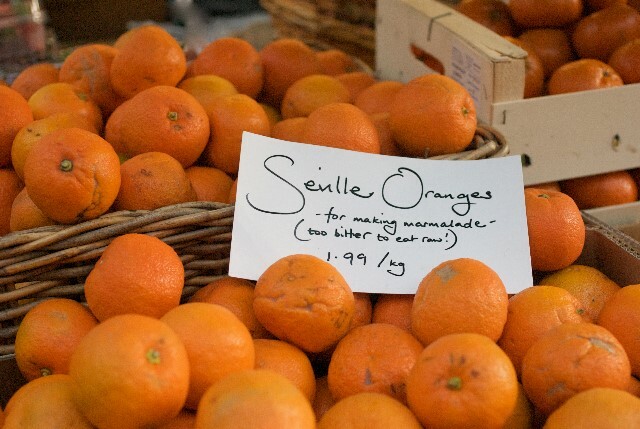 Your marmalade will take about 25 – 45 minutes at a fast boil to reach setting consistency (there are so many variables – the heat, the width of your pan, the amount of pectin, so I can’t be precise). Test the setting consistency after 25 minutes by spooning some hot marmalade straight onto one of your plates from the freezer, allow it to cool for a couple of minutes. 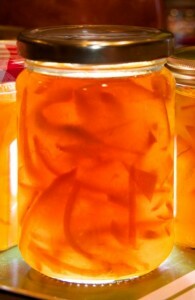 Now push the marmalade with your fingertip, if it’s ready it will form a wrinkly skin as you do so. If not, continue to boil and check at 5 minute intervals. 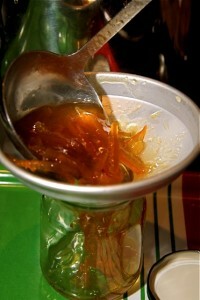 Once ready leave the marmalade to cool for 15 minutes, skim off any last foam and ladle into the hot jars. Cover with waxed disks if using, and seal with lids or cellophane at once. Cut a couple of thick slices of bread and spread one very generously with butter. Open up the marmalade jar and spoon (no paws thank you!) 3 or 4 dollops of the very finest homemade marmalade upon the butter. Top with your second hunk of bread and, using every ounce of self-discipline that a small bear can muster, stop to cut your sandwich in half before devouring. Now wash sticky whiskers and paws. I love Paddington and hope the film is good!